HOW DOES WATER TRANSPARENCY STRUCTURE LAKE ECOSYSTEMS? By controlling light transmission in lakes, water transparency can affect temperature, dissolved oxygen, photosynthesis, visual predation, and nutrients, as well as the distribution of fish, zooplankton, and phytoplankton. In the Global Change Limnology Laboratory, we investigate how water transparency structures lake ecosystems by using our extensive global UV database and advanced sensors to see how transparency changes daily, seasonally, and annually, and how this affects other abiotic factors such as dissolved oxygen, as well as aquatic biota such as zooplankton and fish, and the development of disease and harmful algal blooms (HABs). Williamson, C. E., E. P. Overholt, R. M. Pilla, T. H. Leach, J. A. Brentrup, L. B. Knoll, E. M. Mette, and R. E. Moeller. 2015. Ecological consequences of long-term browning in lakes. Scientific Reports 5:18666, DOI: 10.1038/srep18666. Pilla, R. M., Williamson, C. E., Zhang, J., Smyth, R. L., Lenters, J. D., Brentrup, J. A., Knoll, L. B., & Fisher, T. J. (2018). Browning-related decreases in water transparency lead to long-term increases in surface water temperature and thermal stratification in two small lakes. Journal of Geophysical Research: Biogeosciences, 123, 1651–1665. DOI: 10.1029/2017JG004321. Knoll, L.B, C.E. Williamson, R. M. Pilla, T. H. Leach, and J. A. Brentrup, and T. J. Fisher. 2018. Browning-related oxygen depletion in an oligotrophic lake. Inland Waters DOI: 10.1080/20442041.2018.1452355. The Global Change Limnology Laboratory has one of the largest databases on UV transparency in lakes. This database includes region-intensive data collected over several years at the same sites (such as Lake Tahoe and the Beartooth Mountains in Montana and Wyoming), as well as one-time sampling events from many more lakes across the globe. We also have 30 years of data from three lakes in the Poconos of Pennsylvania. We use the database to better understand how water transparency structures lake ecosystems. In collaboration with Kevin Rose at Rensselaer Polytechnic Institute, we recently received an NSF LTREB grant to continue our long-term database on the Pocono lakes to investigate how decreases in water transparency alter dissolved oxygen and nutrient regeneration. Williamson, C. E., E. P. Overholt, J. A. Brentrup, R. M. Pilla, T. H. Leach, S. G. Schladow, J. D. Warren, S. S. Urmy, S. Sadro, S. Chandra, and P. J. Neale. 2016. Sentinel responses to droughts, wildfires, and floods: effects of UV radiation on lakes and their ecosystem services. Front. Ecol. Environ. 14: 102-109, doi:10.1002/fee.1228. Williamson, C.E., S. Madronich, A. Lal, R.G. Zepp, R.M. Lucas, E.P. Overholt, K.C. Rose, S.G. Schladow, and J. Lee-Taylor. 2017. Climate change-induced increases in precipitation are reducing the potential for solar ultraviolet radiation to inactivate pathogens in surface waters. Scientific Reports 7: 13033, doi:10.1038/s41598-017-13392-2. GLEON (Global Lake Ecological Observatory Network) engages limnologists and information scientists in a global network of lake sensors to document signals that lakes give as they respond to changes in the surrounding watershed and climate. In this spirit, the Global Change Limnology Laboratory has deployed buoys and advanced sensor strings to collect high frequency data on a variety of variables related to water transparency. Mobile buoy for remote locations. With the help of Fondriest Environmental, graduate students in the IGERT-EARS program designed a buoy that was lightweight (to backpack into remote locations) and able to sample 10 water and 6 weather parameters. This “mobile” buoy weighs a mere 30 lbs without sensors and is fairly inconspicuous, an important consideration for an instrument deployed in a remote pristine landscapes. Profiling buoy for data at multiple depths. A second, “profiling” buoy was designed to measure changes in lakes by sampling at different depths. A suite of sensors collect data at the surface as well as during profiling to the bottom of the lake. With the help of the sensors on these buoys, we hope to better understand how changes in the watershed affect variables such as lake transparency, dissolved organic carbon (DOC), and chlorophyll, and how these changes contribute to harmful algal blooms and oxygen depletion (hypoxia, anoxia). Sensor strings for high frequency data in multiple lakes. Since 2016 a string of temperature and dissolved oxygen sensors at multiple depths in our three main study lakes in Pennsylvania have been providing high frequency data (see figure below from Lake Giles). In 2018 we also added several PAR (photosynthetically active radiation, essentially visible light) sensors. This suite of sensors is deployed year-round, collecting a unique set of under-ice data. From these data we hope to better understand critical phenological periods in our lakes such as ice-on, ice-off, thermal stratification, and the onset of low-oxygen conditions. Brentrup, J.A., C.E. Williamson, W. Colom-Montero, W. Eckert, E. de Eyto, H.-P. Grossart, Y. Huot, P.D.F. Isles, L.B. Knoll, T.H. Leach, C.G. McBride, D. Pierson, F. Pomati, J.S. Read, K.C. Rose, N.R. Samal, P.A. Staehr, and L.A. Winslow. 2016. 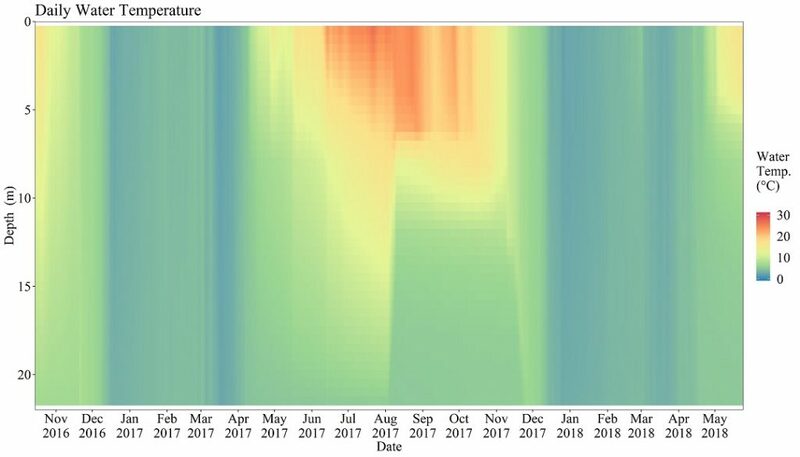 The potential of high-frequency profiling to assess vertical and seasonal patterns of phytoplankton dynamics in lakes: an extension of the Plankton Ecology Group (PEG) model. Inland Waters 6: 565-580; DOI: 10.5268/IW-6.4.890. Fish, zooplankton, and phytoplankton all respond to water transparency. For example, most fish are visual predators, requiring a certain amount of visible light to capture their prey. Zooplankton can be negatively impacted by short wavelength radiation and migrate through the water column in response to predators, food, and light. Phytoplankton require light for photosynthesis, but can be inhibited by UV. Zooplankton In our lab, we have observed long-term changes in the zooplankton community in Lake Giles as the lake has increased in both pH and dissolved organic matter (DOM). Our extensive field and experimental data collection enable us to study how abiotic and biotic factors, including water transparency, have contributed to declines in some zooplankton species and increases in others. Fish Fish predators have increased in Lake Giles with increases in DOM and pH. We are exploring whether there is a shift in the relative importance of fish vs DOM in structuring zooplankton communities. Some of our past research has shown that UV is detrimental to developing larvae, and can even prevent UV sensitive species from invading transparent waters. Harmful Algal Blooms Across the US, lakes have had to limit recreational use due to increases in outbreaks of Harmful Algal Blooms (HABs). Nutrients play a key role in the onset of these events, but our lab is investigating whether increases in DOM may also influence HABs, and the likelihood of toxin production in associated cyanobacteria. Disease One of the beneficial effects of UV is disinfection of pathogens and parasites in water. With lake browning on the rise in many parts of the world, including northeastern North America, our lab is interested in how UV and water transparency affect parasites directly as well as indirectly by influencing vectors of disease such as mosquitoes. Leech, D. M., and C. E. Williamson. 2000. Is tolerance to UV radiation in zooplankton related to body size, taxon, or lake transparency? Ecological Applications 10: 1530-1540. Williamson, C.E, J.M Fischer, S.M. Bollens, E.P. Overholt, and J.K. Breckenridge. 2011. Towards a more comprehensive theory of zooplankton diel vertical migration: Integrating UV radiation and water transparency into the biotic paradigm. Limnology and Oceanography 56:1603-1623. Leach, T. H., C. E. Williamson, N. Theodore, J. M. Fischer, and M. H. Olson. 2015. The role of ultraviolet radiation in the diel vertical migration of zooplankton: an experimental test of the transparency-regulator hypothesis. Journal of Plankton Research 37:886-896. Huff, D.D., G. Grad, and C.E. Williamson. 2004. Environmental constraints on spawning depth of yellow perch: The roles of low temperature and high solar ultraviolet radiation. Transactions of the American Fisheries Society 133:718-726. Tucker, A. C.E. Williamson, K.C. Rose, J.T. Oris, S.J. Connelly, M. Olson, and D.L. Mitchell. 2010. Ultraviolet radiation affects invasibility of lake ecosystems by warm-water fish. Ecology 91: 882-890. Connelly, S. J.; E.A. Wolyniak, C.E. Williamson, and K.L. Jellison. 2007. Artificial UV-B and solar radiation reduce in vitro infectivity of the human pathogen Cryptosporidium parvum. Environ. Sci. Technol. 41: 7101-7106.